Do you do that thing when, faced with an insurmountable and beyond overwhelming to-do list, you instead choose to do something entirely unrelated and pretty much unproductive? Because it’s after midnight as I’m typing this, and trust me when I tell you that the amount I have to do to make all the Christmas magic happen is insane. Oh, speaking of insane, welcome to my home. The place where I impose silly Christmastime traditions like home renovations on impossible timelines. In 2014, I almost had to ask my carpenters to stay for Christmas dinner to get our front porch finished in time to allow guests to walk through an actual front door instead of shimmying in through a side window (because it’s the little things that make you feel welcome). It was a highly stressful time. Who the hell would repeat these mistakes of the past? What kind of self-punishing fool would decide to “just upgrade the powder room” and then maybe have things sort of domino while insisting that all will be fine to host 30 people for Christmas? It’s cool, though. We still have two weeks to go. Let me show you that we really don’t have much left to do. Here, you’ll see that our living room is ready to greet our friends and family in full Christmas decor. Clearly everyone will pick up on our festive theme upon entering our home. In the far end of the photo, you’ll see our dining room – the place where we will gather to cherish our holiday meal together and form a lifetime of memories. 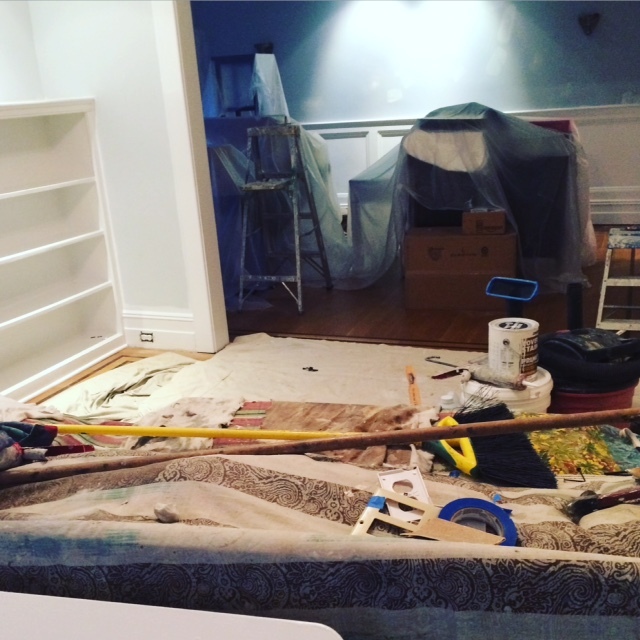 Before you become concerned about the dining room, let me give you a closer look. The only real question left is whether to use the white or cream placemats. These decisions can be stressful. I’m also thinking that maybe I just spotted my kids’ homework under that tarp. But in terms of logistics and necessity, do not worry. 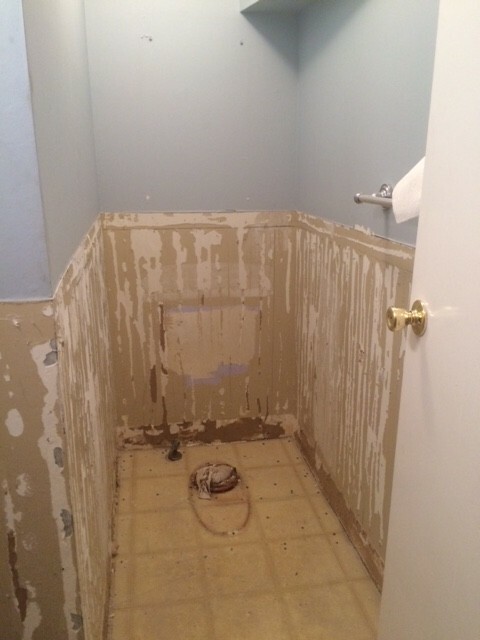 The new bathroom is definitely on track for completion. Just a few final touches and it will be ready to go! I really should get the Christmas hand towels into the laundry since I’ll need them any day now. And, you’ll be glad to know that, despite all evidence to the contrary, I actually have extremely low blood pressure. So there’s room for error before I stroke out completely. There’s a reason I like you guys so much. I decided that a much more engaging use of my time would be to make a flowchart. See, I’m in the middle of sending out my holiday cards and am having my annual crisis of conscience over where to make the cuts in my list. I err on the side of ruthlessness but maybe I’ve been hasty. Perhaps it’s time to spread some additional cheer. Because going back to the post office this week would prove that there is a worse place to be than in my own home, and that would bring me more comfort than spiking my coffee. Yeah, you’ll need to zoom in. Sorry, it’s late and my Edit Image skills are not up to par right now. I’ll try to tweak it next time I’m looking to avoid any and all responsibility. 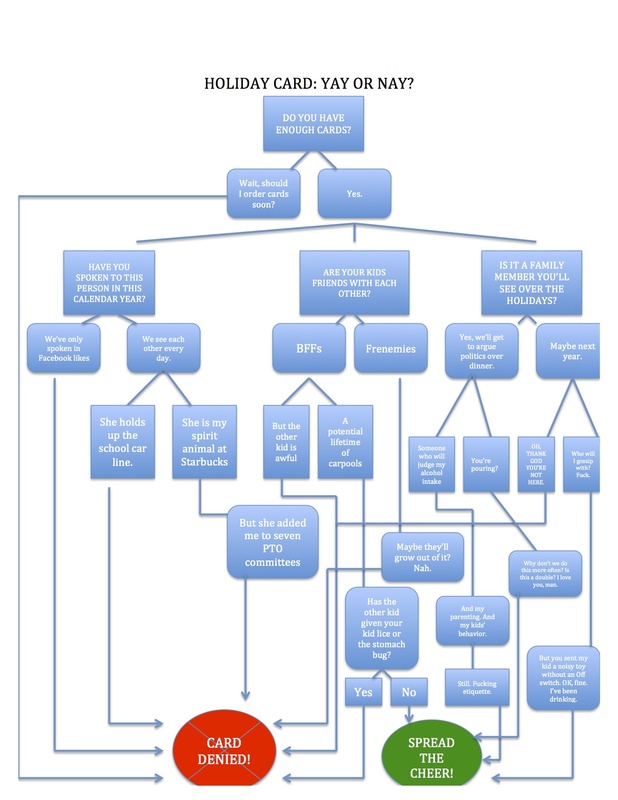 So, in the spirit of public service, I hope you’ll find my flow chart both useful and timely. To be clear, this assumes you’ve already made basic decisions about your list. If you’re looking for advice on whether or not to cut out your parents or neighbors, I’m probably underqualified. This highly scientific approach that I’m advocating is really for the gray areas. The ones you and your spouse might not agree on. The ones that test the boundaries of your holiday spirit. The ones that make you question just how you want to use your last holiday Forever stamps. If nothing else, I hope I’ve made you feel better about your holiday preparedness levels. And if your gifts happen to be wrapped and you’re looking for some amazing holiday deed to perform in the name of humanity, please drop by and I’ll pass you a paint brush. With wine and a straw. Hysterical. 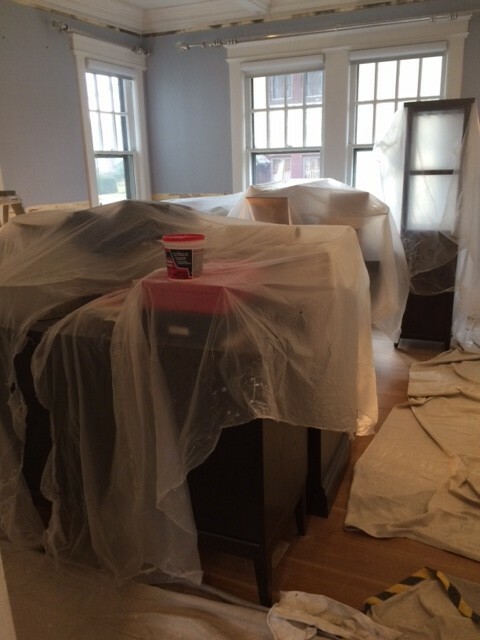 And you are not allowed to come help me again until you are at least down to 4 tarps and a toilet.